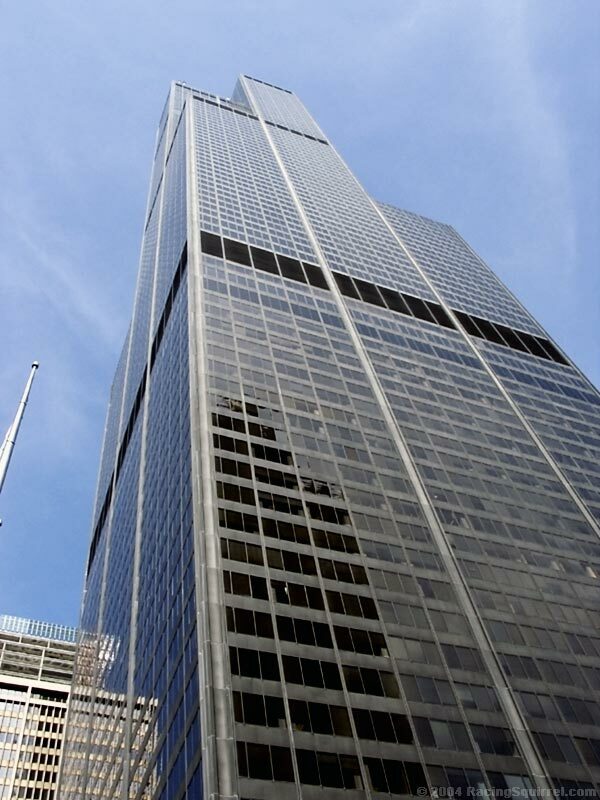 Construction started on the Sears Tower in 1970 and was completed in 1973. It is 443 meters high and 520 meters including twin antenna towers. 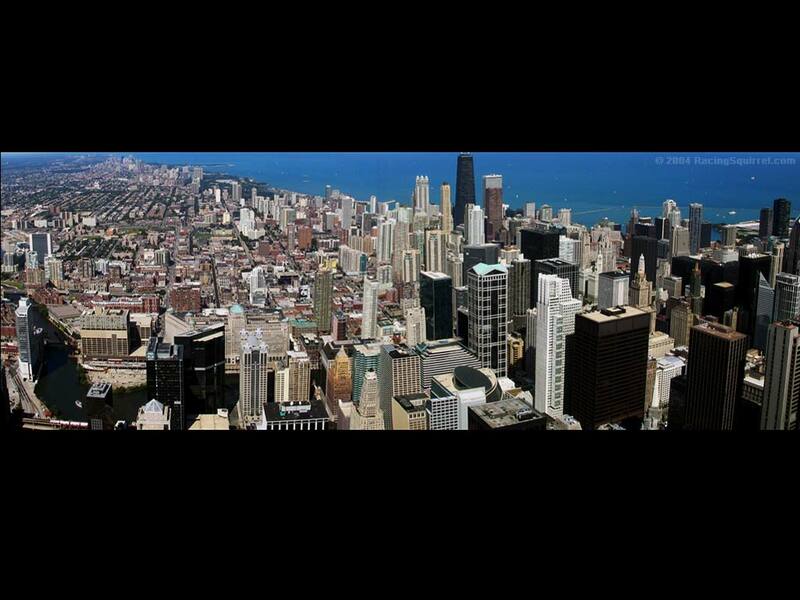 These photos were taken on the Skydeck which is 412 meters above the ground. The average sway of the building is appox. 152 mm/6 inches from true center.The weight building weighs 201.849,000 kg. or 222,500 tons. Construction cost 150.000,000 USD. I have lived in Chicago since 1983. 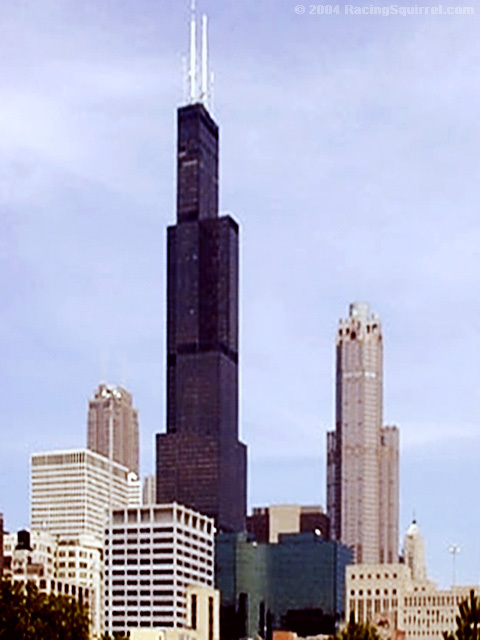 Only in 2002, did I make my first trip to the Sears Tower Observatory. I worked in the Sears Tower for 6 years, and I still never made a trip. A hometown friend of mine came in, and I went upstairs for the first time. This year, Monika and her mother are visiting from Czech Republic (Ceske Republice), and so we went to the top. These are the pictures, along with some I snapped on planes hovering Chicago O'Hare International Airport. The bottom two frames in grey, show the Chicago Neighborhoods. In my twenty years here, I have lived in Hyde Park (south), Lincoln Park (near north), Lakeview (near north) and St Bens/North Center (north and near west side). Visitors from out-of-town and the suburbs should enjoy the night life along Rush Street. Many Blues Clubs and urban yuppie type bars and clubs are located in Lincoln Park. More neighborhood and laid-back bars are located in Lakeview and Wrigleyville, While in town, don't forget to take in a Cubs baseball game at Wrigley Field. Since I lived there fifteen years ago, the Lakeview and Lincoln Park areas have gotten price prohibitive, with 1.000.000$ stand alone homes. 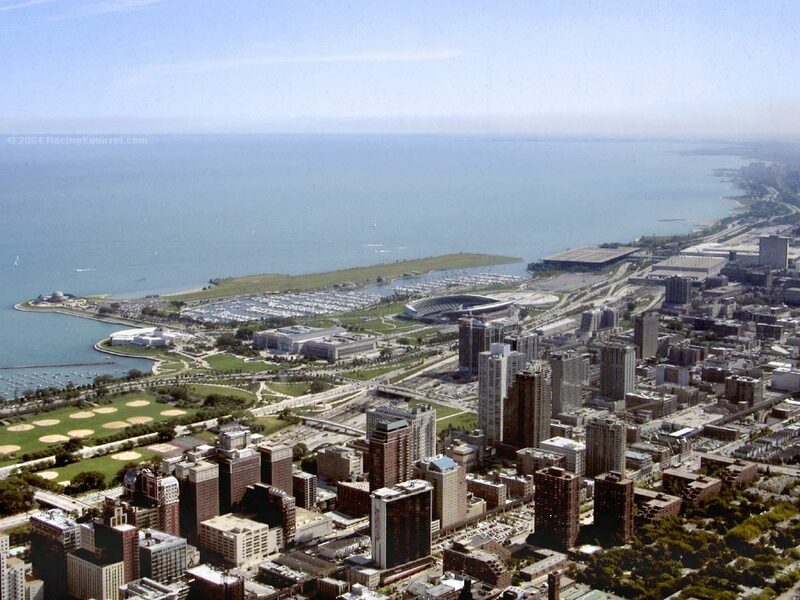 More affordable housing away from the lakefront is available in Bucktown and Wicker Park. There is even a movie and MTv Real World segment located in Wicker Park. When there, make sure to see a show at the Double Door, Chicago's hip venue since Lounge Ax in Lincoln Park closed down. Further north, North Center and Ravenswood offer some more laid back bars. No real dance places, but some Chicago establishments, such as the Green River Tavern and the legendary Riviera Theater for live shows. For a taste of the Emerald Isle on the near northside, try Globe Bar on West Irving Park next to North Damen and North Lincoln Avenue or watch Gaelic Football or International Football at the The Abbey Pub on North Elston just south of Irving Park. There is a vibrant nightlife located just north and northwest of downtown. 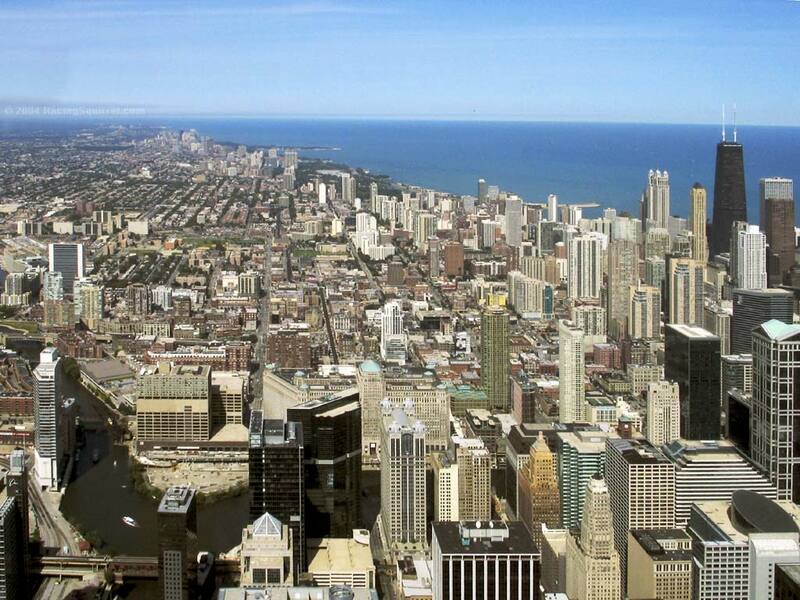 River North is home to many upscale galleries, tourist bars such as Hard Rock Cafe, and Michael Jordan's restaurant. Although not pictured, in River West and the Warehouse District just west of downtown, are some of the city's most chic restaurants and night clubs. Crobar and Transit are located in these areas. On the near south side, over the last decade, the area has enjoyed a revival. The area is primarily residential leading all the way to Chinatown. 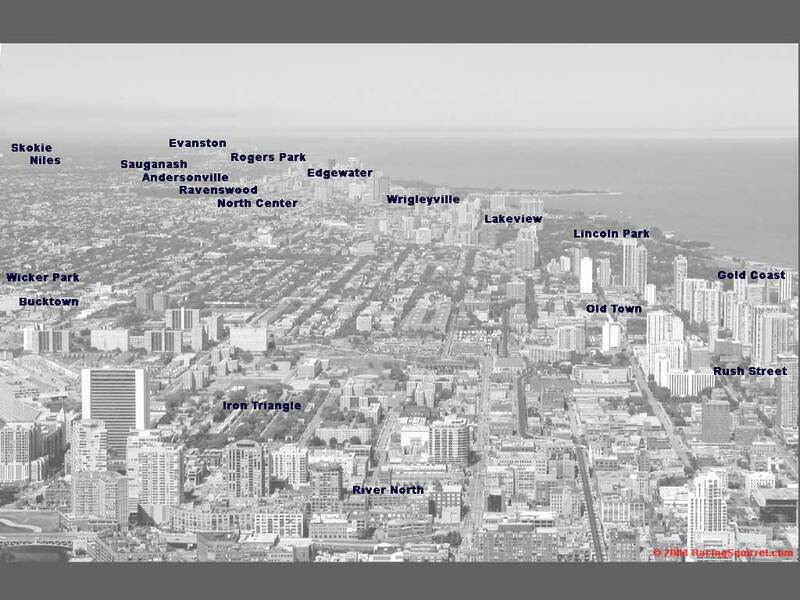 Not pictured to the west of Chinatown is Pilsen and University Village area: home to The University of Illinois at Chicago and Illinois Institute of Technology.